This market is more richly valued than you think, but opportunities still exist. Five stocks that look attractive, three to avoid. Despite high expectations for earnings growth at the start of the year, U.S. companies delivered only ho-hum results for the second quarter, and estimates for the current quarter are plummeting. Downward revisions of fourth-quarter estimates can't be far behind. That's not to say that this market is going to crash, last week's 2% drop notwithstanding. But stocks aren't as cheap as they look, either. It's a familiar Wall Street waltz. Analysts start out with rosy projections for distant quarters; companies gracefully guide expectations lower as the year unfolds; and both sides end up with easily beatable numbers come reporting time. In 29 of the past 37 years, estimates have started too high, according to Morgan Stanley. The Standard & Poor's 500 has handily racked up compounded yearly returns of more than 11% during that period. The next round of estimate cutting may not go smoothly. Stock valuations have swelled, making the stakes higher for companies that fail to produce healthy growth. Opportunities for easy earnings gains through cost-cutting have shrunk. There's evidence that more companies are falling back on a bad habit: using accounting adjustments to earnings to beat estimates. The numbers suggest that stocks, up 13% a year on average over the past four years, could slow from here. 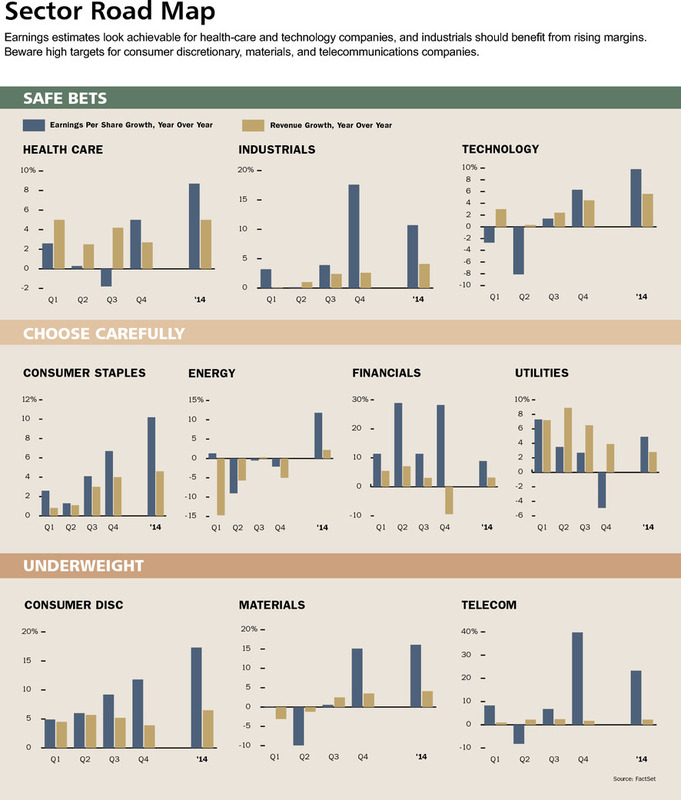 Cautious investors should avoid sectors that look particularly prone to near-term estimates cuts, like consumer discretionary and telecom, while favoring sectors on safer ground, like technology and health care. A search for promising companies yielded five stocks, including drug maker Pfizer (ticker: PFE), industrial manufacturer Danaher (DHR), and wireless chip maker Qualcomm (QCOM). Three to avoid are jeweler Tiffany (TIF), industrial gas producer Praxair (PX), and home builder Lennar (LEN). During the second quarter, companies in the S&P 500 grew earnings by 2.1% on a 1.8% rise in revenues, compared with the second quarter of 2012, based on the 93% of companies that have reported results, according to FactSet. Meanwhile, rising demand for stocks has pushed the index 18% higher over the past year. That means shares have gotten more expensive relative to earnings. The index trades at 14.2 times earnings forecasts for the next four quarters, up from 12.6 a year ago. That's on par with the 14.2 average of the past decade. But it's based on projections that look too ambitious. The consensus estimate on Wall Street assumes that earnings growth will accelerate to 3.9% in the third quarter, and more than double, to 10.5%, in the fourth. The third-quarter estimate has already been slashed by more than a third since the end of June, but the fourth-quarter forecast has barely budged from 11.9%. Recent earnings gains have come largely from revenue growth with only a smidgen of margin improvement. That suggests that after five years of aggressive cost-cutting, companies are finding it more difficult to squeeze extra earnings out of each sales dollar. Among nonfinancials in the S&P 500, operating profit margins are 13.6%, higher than the historical average of 12.1%, according to Bank of America Merrill Lynch. For the third quarter, companies are projected to increase their revenues by 2.8%, making a 3.9% earnings gain seem feasible, if not a sure thing. The fourth quarter is a different story. Sales are expected to grow only 0.6%, making a double-digit jump look suspiciously high. "Where's that margin growth going to come from? More layoffs? Productivity gains? Most of us aren't exactly napping on the job as it is," says Howard Silverblatt, chief index analyst at S&P. "Second-half forecasts look very optimistic. So does 2014." For the first two quarters of next year, published forecasts show continued strong earnings growth of 6.8% and 11.1%. Replace those numbers with more realistic assumptions, and the stock market appears pricier. Assume, for example, that earnings growth will indeed quicken but will average 5% over the next four quarters. That would push the valuation of the S&P 500 to 15.3 times forward earnings, just about where it was when the market peaked in October 2007. OTHER SIGNS DO LITTLE to suggest rising earnings momentum. As usual, most companies beat earnings forecasts in the second quarter, but the average size of the beat, 2.4%, was less than the four-year average of 7%, according to FactSet. Financials drove all of the earnings growth and then some during the quarter; ignore them and earnings were down about 3% from a year ago. Among 92 companies in the S&P 500 that have issued third-quarter guidance, 82% have guided lower, versus a five-year average of 62%. And companies that miss forecasts are seeing bigger declines in their shares than usual, according to BofA. There's also the matter of just what constitutes earnings. Companies must report them based on generally accepted accounting principles, but they're free to also report non-GAAP earnings that exclude one-time expenses. Wall Street typically focuses its forecasts on these non-GAAP numbers. Managers have some discretion is deciding whether, say, the cost to close a store or lay off some workers is one-time in nature or a regular part of business. They appear to be making such judgments opportunistically; companies are more likely to meet or beat earnings forecasts when their non-GAAP earnings exceed their GAAP ones, according to a paper published in July in the Journal of Accounting and Economics by Mark Soliman at the University of Southern California, Jeffrey Doyle at Utah State University, and Jared Jenning at Washington University in St. Louis. THIS DOESN'T MEAN that the market's long bull run is over. Bond yields have picked up on hints the Federal Reserve will end its program of buying bonds to suppress interest rates, but they remain low by historical standards. The 10-year Treasury yields 2.8%, up more than a percentage point from the start of May, but well below its half-century average of 6.7%. Low bond yields make stocks more attractive by comparison. And cash-stuffed companies are devoting record sums to dividends and share repurchases. Add the two together and the result is a 4.6% payout to shareholders, higher than the yield on investment-grade corporate bonds, according to a recent analysis by JPMorgan. Meanwhile, rising home and investment-account values bode well for consumer spending. Household debt and delinquencies are down. Even Europe is coming around. Gross domestic product in the 17-nation euro zone expanded at an annualized pace of 1.1% in the second quarter, according to data released this past week, ending six straight quarters of contraction. As for already high profit margins, BofA thinks they are due less to a short-term economic upswing than a long-term decline in company borrowing costs and tax rates, as companies earn more overseas. Since those conditions won't soon change, margins should remain high, and perhaps push a touch higher, the firm says. ONE WAY FOR INVESTORS to avoid having their portfolios hit by tumbling estimates is to favor sectors where earnings gains look reasonable relative to revenue growth. For example, technology firms are expected to increase their earnings by 6.3% in the fourth quarter on a 4.5% rise in revenues. That's achievable at a time when the shift to cloud-based computing is driving down costs, although the sector isn't immune to stumbles. Cisco Systems (CSCO) shares tumbled 7% on Thursday after the company edged past Wall Street forecasts but announced plans to lay off 5% of its workforce. Health-care targets look relatively achievable, too, with earnings seen rising 5% in the fourth quarter on 2.7% revenue growth. But growth numbers alone don't always tell the whole story. Adam Parker, chief U.S. equity strategist at Morgan Stanley, favors technology and health care but also industrials, which are seen growing fourth-quarter earnings by a whopping 17.6% on a 2.6% rise in revenues. The reason: A large portion of manufacturer costs are fixed in the form of plant and equipment. That gives them high incremental margins -- the ability to turn small revenue increases into large earnings gains as they operate closer to full capacity. On the other hand, expectations for consumer-discretionary companies like department stores and restaurants; materials producers like steel makers; and telecoms seem too high. For telecoms, fourth-quarter growth estimates are skewed higher by AT&T's (T) massive charge last year for pension costs and Hurricane Sandy damage. But Wall Street is predicting a strong start to next year, too -- 11.4% earnings growth in the first quarter. Yet subscriber growth for wireless carriers has stalled, except at T-Mobile, which is taking market share by undercutting on price. That's not a backdrop for a big rise in industry margins. Financials are a wild card. Their earnings-growth forecasts are off the charts but are also in keeping with recent reported growth, as banks rebound from a stretch of depressed profitability. Stockpickers can reduce risk by holding companies with reasonable valuations. One of the best predictors of future returns is high free cash relative to a company's stock-market value, says Morgan Stanley's Parker. Free cash, a simple tally of the cash companies clear each quarter, rather than the paper profits they record, offers a side benefit for investors. It's less subject than non-GAAP earnings to those discretionary tweaks by managers. 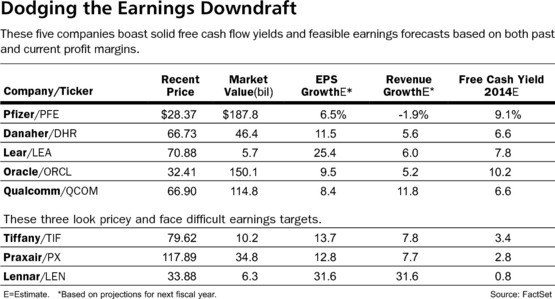 An analysis performed for Barron's by Morgan Stanley scored companies by free cash yield as well as incremental margin analysis, a look at the likelihood of companies turning new revenues into projected earnings gains. It produced five good bets. PFIZER REPORTED LOWER REVENUE and earnings last quarter due to generic competition for blockbuster drugs like Lipitor for cholesterol, but the worst of the company's patent expirations are over. As drugs in late-stage development come to market, earnings should rise an average of 7% a year through the end of the decade on 1% yearly revenue gains, predicts JPMorgan analyst Chris Schott. The company says it plans to split the fast-growth portion of its drug business from slower-growing ones in a restructuring. That could earn it a higher valuation, because at 12 times next year's earnings forecast, it now trades roughly in line with slow growers like Merck (MRK) rather than fast growers like Bristol-Myers Squibb (BMY), at 21 times earnings. Pfizer shares, which closed on Friday at $28.37, carry a dividend yield of 3.4%. Danaher makes a wide range of machines and equipment for clinical research, packaging, water treatment, and more. Its playbook involves using free cash flow to make frequent acquisitions, and then applying lean manufacturing techniques to drive margins higher in the new businesses. Earnings per share are expected to rise 6% this year on a 4% increase in revenue. The company's reputation as a steady earner makes its shares popular; they go for 18 times next year's earnings, based on Friday's price of $66.73. But the earnings forecast understates the amount of cash the company is generating. Shares trade at less than 15 times next year's projected free cash. Lear (LEA) makes seating and electrical systems for cars and light trucks. Car production has rebounded strongly in the U.S. but is only beginning to show improvement in Europe. Lear is growing faster than the market. Last quarter, its revenue rose 12% on only a 3% increase in global production. The company appears to be gaining market share in seating, while increased computerization of cars means the electrical content is rising. At $70.88, the shares go for 10 times next year's earnings forecast. Unlike the broad market, Oracle (ORCL) and Qualcomm have seen their earnings grow faster than their share prices of late. Both look attractively priced. Qualcomm is the dominant supplier of broadband wireless technology, particularly for high-end smartphones. Wall Street expects average selling prices for phones to fall slightly next year, but Qualcomm may benefit from an iPhone launch this fall and gains with fast-growing handset makers in emerging markets. At $66.90, shares go for under 14 times forward earnings. Oracle sells software and hardware to help companies manage data. The industry is shifting from locally installed systems to cloud-based ones, and Oracle has rolled out its own cloud offerings. Its customers face high costs to switch vendors, which bodes well for keeping them. Oracle recently signed deals with cloud rivals Microsoft (MSFT) and Salesforce.com (CRM), suggesting its systems remain an industry standard. Shares closed on Friday at $32.41. They trade at 11 times earnings. ICONIC JEWELER Tiffany, meanwhile, has been enjoying fast growth overseas, but its shares look expensive at 20 times next year's earnings -- and that figure assumes its earnings growth rate will jump next year. Praxair is the world's third-largest industrial gas supplier. Wall Street expects its earnings growth to rise from 7% this year to 13% next year. Even with such a pickup, shares already trade at 18 times next year's earnings. Home builder Lennar is just the kind of land-rich home builder to benefit from the housing recovery, and its recent results have been strong. But rising mortgage rates, home inventories, and labor and materials costs suggest the recovery may downshift into a slower phase. Lennar's earnings are currently projected to rocket 32% higher on similar revenue growth in its next fiscal year. Amid all the speculation over whether Larry Summers or Janet Yellen has the edge in the race for Federal Reserve chairmanship, amid the hunt for clues on their monetary policy philosophies and the debate over the relevance of their respective leadership styles, it may be that there is a simpler way to look at this. If there is a 10 per cent correction in the US equity market, Ms Yellen gets the job. The intriguing idea, as set out by the chief US economist at Moody’s, John Lonski, is that a stock market sell-off would signal a loss of confidence in the economic recovery. It would suggest that higher interest rates are more likely to trigger a downturn than they are to reflect an economy achieving “escape velocity” from recession. In turn, that would require the White House to appoint the candidate perceived as most dovish. If that seems a hair-trigger for a decision of such long-term import, it would also be a recognition that the Fed is losing control of long-term interest rates and that signals matter if it wants to maintain what grip is left. Consider the events of the past 48 hours. You had to scrabble around pretty hard to find anything new in the minutes of the July meeting of the Federal Open Market Committee. There was no discussion of September versus December for tapering quantitative easing, or of $10bn versus $20bn for the reduction in monthly bond purchases. And yet the absence of dovish signalling was enough to move the yield on the benchmark 10-year Treasury decisively above 2.90 per cent in subsequent trading. Nothing has brought the rate down, not mixed economic data, not the weak corporate earnings outlook, not even the prospect of financial turmoil in emerging markets that usually brings money back into havens. Nothing now seems to stand in the way of a 3 per cent yield on the 10-year. Clearly the “natural” level of interest rates is substantially higher than markets had previously believed. As recently as June, primary dealers surveyed by the Fed gave no more than a one-in-10 chance of the 10-year being above 3 per cent by year-end. Fewer than half thought it would breach that level even before the end of 2014. That was already factoring in an expected end to QE by the middle of next year. Bond markets are hurting. Professional investors in the $1.3tn-a-year market for mortgage-backed securities have seen big losses on their portfolios, and their need to hedge by selling five-year, seven-year and 10-year Treasuries is adding to the upward pressure on rates. Investment grade corporate bonds, which are among the most sensitive to interest rates, have generated returns of minus 4.3 per cent so far this year, according to Barclays data. Retail investors who clamoured for a slice of Apple’s $17bn bond issue in April are sitting on paper losses of up to 17.5 per cent, as the value of the 30-year tranche has slumped. The iPhone maker’s 10-year debt, of which it raised $5.5bn, is now down 11 per cent. 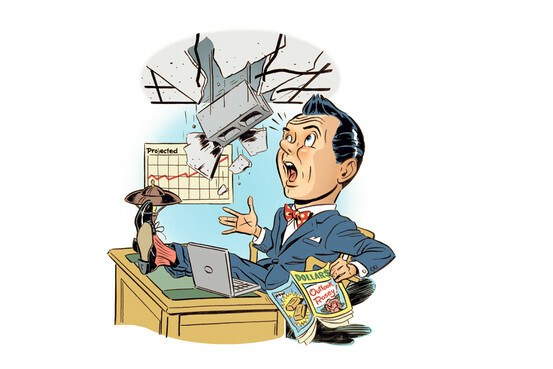 This might not matter to someone intending to hold the bonds to maturity, but for most investors seeing the value of their mutual funds or exchange traded funds eroding, it is prompting a reassessment. TrimTabs estimates that, across the whole universe of bond funds and ETFs, some $30bn has already been withdrawn this month, setting August on course to be the third-most-negative month for the industry in the past 30 years. The evaporating demand for bonds adds to the downward pressure on prices and the upward pressure on rates. It raises the cost of buying a house – Freddie Mac said on Thursday that rates on 30-year fixed-rate mortgages jumped to a two-year high last week – and it changes the calculus for business investment. It has all but eliminated the possiblity of refinancing an existing mortgage, and a long period of lucrative financial restructuring by companies tapping the bond market may also be coming to a close. The Fed’s minutes revealed officials still believe the US economy can withstand these higher rates, and while they sounded more nervous about their conclusion, they also showed no sign of backing away from tapering QE. The pick of the next Fed chairman this autumn cannot now be separated from these signals. Rightly or wrongly, Mr Summers’ previous scepticism about QE has put him to the hawkish side of Ms Yellen, whose commitment to the full-employment half of the Fed’s mandate has been absorbed by the market. The equity market had a schizophrenic response to the Fed minutes, first falling, then recovering on Thursday. It does not have enough data yet to judge the impact of the higher rates the Fed has unleashed. But that data will come, and the equity market may be a harbinger of what – and who – comes next. The day before Indian financial markets had had their rockiest session for many years. The rupee sank and stockmarkets tumbled. Money-market rates rose. The shares of banks thought to be either full of bad debts or short of deposit funding fell sharply. The sell-off had been made worse by new capital controls introduced on August 14th in response to incipient signs of capital flight. They reduce the amount Indian residents and firms can take out of the country. Foreign investors took fright, fearful that India might freeze their funds too, much as Malaysia did during its crisis in 1998. India’s authorities have since ruled that out. But markets keep sliding. On August 20th the RBI said it would intervene to try to calm bond yields. The rupee has dropped to over 64 to the dollar, an all-time low and 13% below its level three months ago. It is widely agreed the country is in its worst economic bind since 1991. India is not being singled out. Since May, when the Federal Reserve first said it might slow the pace of its asset purchases, investors have begun adjusting to a world without ultra-cheap money. There has been a great withdrawal of funds from emerging markets, where most currencies have fallen by 5-15% against the dollar in the past three months. Bond yields have risen from Brazil to Thailand. Some governments have intervened. On July 11th Indonesia raised its benchmark interest rate to bolster its currency. On August 21st its president said he would soon announce further measures to ensure stability. 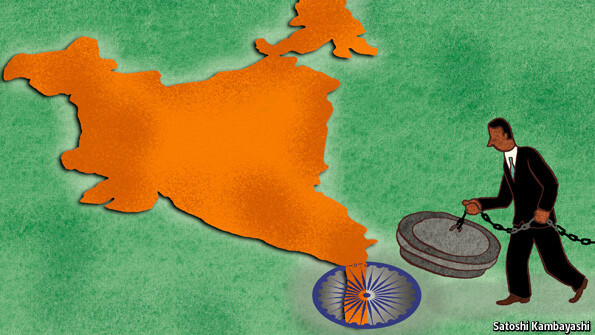 India, Asia’s third-biggest economy, is more vulnerable than most, however. Economic news has disappointed for two years, with growth falling to 4-5%, half the rate seen during the 2003-08 boom. It may fall further. Consumer-price inflation remains stubborn at 10%. A drive by Palaniappan Chidambaram, the finance minister, to push through a package of reforms and free big industrial projects from red tape has not worked. An election is due by May 2014, adding to uncertainty. 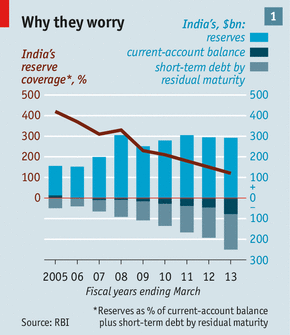 India’s dependence on foreign capital is also high and has risen sharply. The current-account deficit soared to almost 7% of GDP at the end of 2012, although it is expected to be 4-5% this year. External borrowing has not risen by much relative to GDP—the ratio stands at 21% today—but debt has become more short-term, and therefore riskier. Total financing needs (defined as the current-account deficit plus debt that needs rolling over) are $250 billion over the next year. 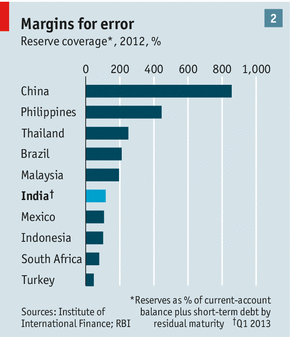 India’s reserves are $279 billion, giving a coverage ratio of 1.1 times. That has fallen sharply from over three times in 2007-08 (see chart 1) and leaves India looking weaker than many of its peers (see chart 2). It is therefore vital that foreign equity investors stay put. They own perhaps $200 billion of shares at current prices. They have sold only about $3 billion since May, but if they head for the exit India would have no defence. This is not a repeat of 1991. When India last had a crisis Boris Yeltsin was about to stand on a tank in Moscow and Nirvana was hitting the big time. Things have changed in financial terms, too. Back then India had a fixed exchange rate, which the state almost bankrupted itself trying to defend—it had to fly gold to the Bank of England in return for a loan. Today India has a floating exchange rate and a government with almost no foreign-currency debt. A slump in the currency poses no immediate threat to the government’s solvency. The pain will be felt in other ways. Private firms that owe most of India’s foreign debt will be under intense strain, particularly if the rupee drops further. Some will go bust. Market interest rates will stay high, causing a liquidity squeeze. All this makes life even tougher for India’s state-owned banks, which already have sour loans equivalent to 10-12% of their loan books. Inflation will rise. And the government’s finances will be under strain as the cost of its subsidies on imported fuel gets bigger. There is probably little the authorities can do to shore up the currency in the short term. The rupee is one of the world’s most actively traded currencies and at least half the turnover is abroad. Privately, officials reckon the rupee’s fair value, taking into account India’s higher inflation and productivity over the past few years, is a little less than 60 per dollar, so the market has yet to overshoot wildly. Raghuram Rajan, the incoming governor of the RBI, is likely to take a hands-off approach. That doesn’t mean the government will—or should. On August 19th it banned the import through airports of duty-free flat-screen TVs, which Indians can often be seen heaving through check-in at Dubai. It may seek to raise duties further on gold imports, which Indians are addicted to in part because it is seen as a hedge against inflation. Gross gold imports were 3% of GDP last year, blowing a huge hole in the external finances. History suggests the higher taxes on gold imports are, the worse smuggling gets. But India imports 800-odd tonnes of bullion a year. That’s a lot of gold to hide in suitcases. The government will also try to persuade the Supreme Court to lift its ban on iron-ore exports, imposed after a series of corruption scams. At its peak this industry generated exports worth about 0.4% of GDP, although experts doubt that mothballed mines can be ramped up fast. The government may also cut fuel subsidies. That would reduce demand for imported fuel and help it hit a fiscal-deficit target of about 7% of GDP (including India’s states). The longer-term solution to the balance-of-payments problem may be to ramp up India’s manufacturing sector, and thus its industrial exports. But that will take a big improvement in the business climate, not just a cheap currency. Despite the rupee’s 27% tumble in the past three years there is scant sign of global manufacturers shifting production to India. India’s position could still get worse. But assuming things stabilise, when the official histories come to be written about 2013, what might they say? Most likely that the rupee’s slump caused a severe shock to the economy that made a recovery in growth rates even harder. But perhaps, also, that it prompted a more serious debate about the policies that India needs to become less vulnerable to the whims of an unforgiving world.